On behalf of Ventspils University College (VUC) we invite you and your colleagues to participate at Erasmus+ International Staff mobility for Training days at VUC in Latvia. International Staff Mobility for Training days are planned to take place the week of 25-27 April, 2016. Number of places is limited (not more than 2 representatives from each institution). All participants will be asked to make a short presentation (10-15 min each) about their University. There is no participation fee. Coffee, dinner on the first day, breakfast and lunch on the second day and all activities mentioned in the programme are on us, but we kindly ask you to cover expenses for travel, board and lodging. As to the accommodation, support is provided through a selection of hotels near the university but participants are kindly asked to make their own reservations. Please find attached a more detailed information about our Staff Training days. The deadline for application is March 21, 2016 and please click here to register. Confirmation to all interested participants will be sent by e-mail after March 21, 2016. 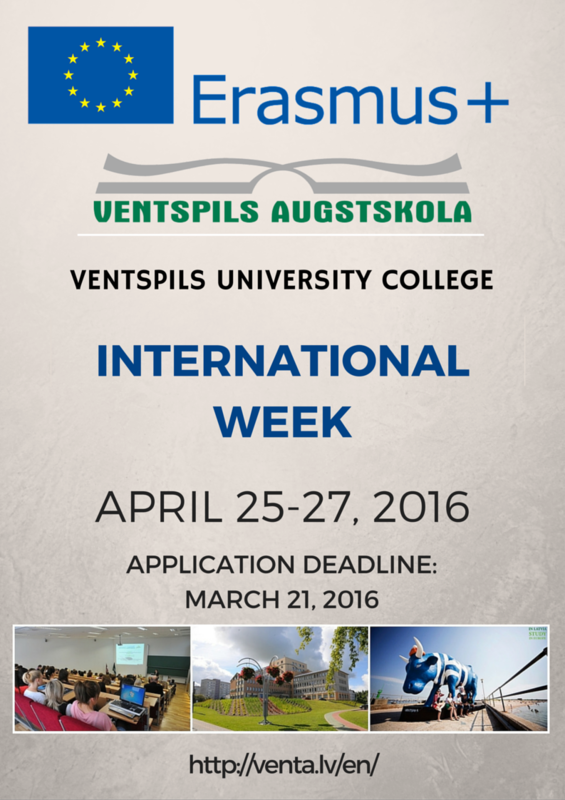 We look forward to welcoming you in Ventspils!